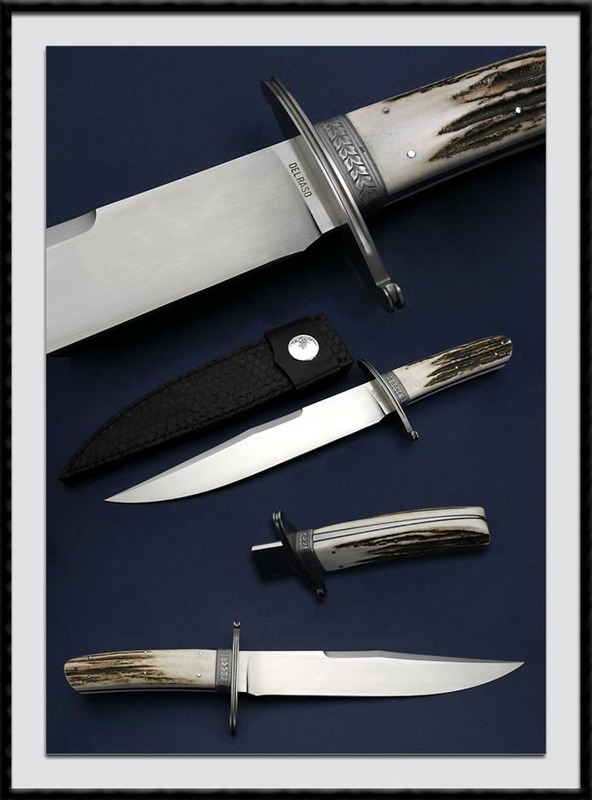 An Engraved Stag Bowie crafted by Australia, Peter De Raso as seen on page 79 in Knives 2003 issue, BL = 9 1/8", OAL = 14", Flat ground ATS-34 @59RC, Hand rubbed Satin Finish blade with a Distal Taper, unsharpened Clip, Full Tapered Tang, Fluted Stainless "S" Guard, Stainless and engraved Ferrule, 7 SS Pins and a Black liner accent Presentation Samba Stag scales, Engraving by Fellow Aussie Phil Vinnecombe. Fit and Finish are of the Highest Quality. Comes with the custom sheath pictured. Condition is Pristine.